The interior work is finally done! It took a little longer than expected – partially due to underestimating the time it takes to do something like this, partially due to miscellaneous product backorders and delays – but, at long last, I can say that the work is at a point I feel proud enough to present. 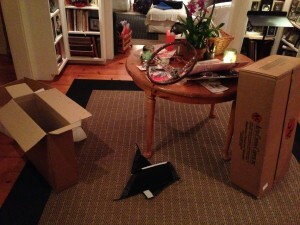 In my last post, a major blizzard was closing in and due to arrive the same day as my upholstery. Alas, despite my somewhat uncomfortable level of forced optimism, the upholstery did not arrive the day I had intended it to. The blizzard pushed the delivery date back three days to Monday, and I missed the opportunity of that weekend to get the final work on the seats done. Luckily for me, I guess, there was still plenty of work to do before the seats went in… so I stayed very busy, despite the storm. 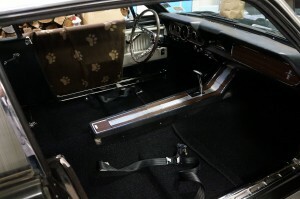 Everything, sans seats, was finished that weekend: the rear quarter trim panels, kick panels, door sill plates, instrument panel, speedometer cable and center console all went in – all brand new, apart from the rear quarter trim panels and frame for the center console. Everything looked amazing, and the sight of the near-finished product gave me motivation to finish it. 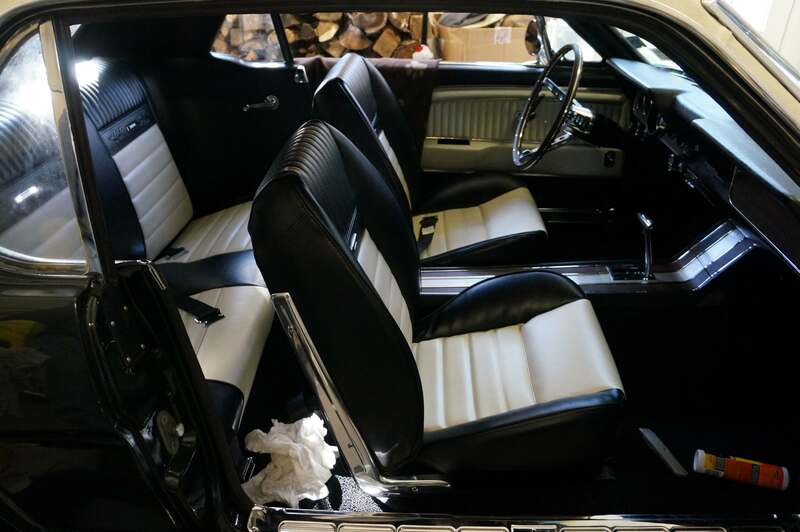 Monday rolled along, delivering with it a full set of black and white Mustang upholstery, but it was also the first day back at school, post-holiday. I couldn’t spend the whole day working on the car anymore, so I relocated one of the seats and all the necessary equipment from my grandmother’s garage to my Dad’s studio. This way, I could work on reupholstering one seat a night after school during the week. It became clear very early on that this was a two person job, and, as he had been throughout the whole project, my Dad was right there to help. The amount of stretching, squeezing, pressing, holding, pulling, clipping and general work that needed to be done to finish one seat was really tough on our hands, not to mention our bodies (and admittedly our emotions). This was definitely the hardest part of the project. It took us four evenings to complete, but we finally finished the driver’s seat. Ugh! One down, and now we needed to do it all again… and then again, for the rear bench. By the following weekend, the rest of the seats were done… and luckily things got easier with experience. On Monday, I took the day off from school to mount all the seats, buff out as much of the scratch on the windshield as possible, and clean up the significant mess we had made in my grandmother’s garage and basement. 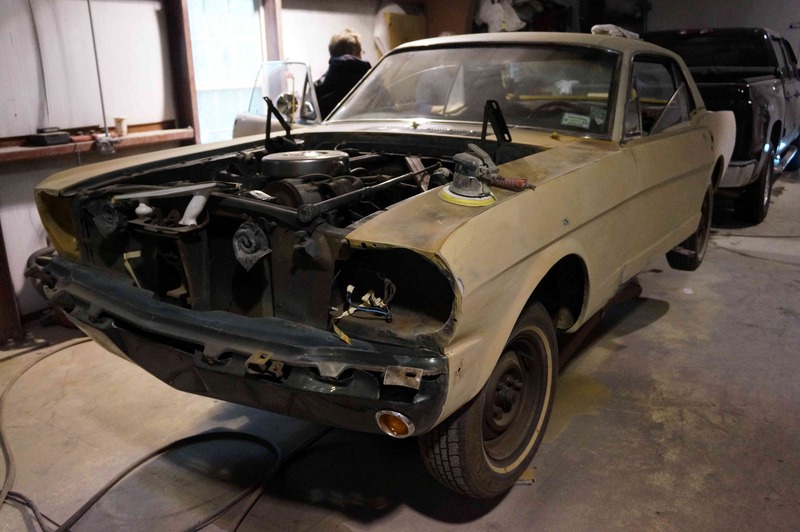 My Mom even lent a hand to put the finishing touches on the car – repainting the emblems and the gas cap with the Mustang logo colors to look almost new. When all was done that evening, I took my parents out for a little victory lap… to fill up the gas tank and enjoy the finished interior. Tomorrow is Senior Project Exhibition Day at school, and I’ll be officially unveiling the refurbished Pony. The new bumpers have yet to arrive (they’re due to arrive Friday, the day after the exhibition), so we had to put the old bumpers on instead. Even though they aren’t new, they do complete the look, and the new ones will go on as soon as possible. All that’s left to do is the final before-and-after video, which I will complete in the next week or so. But, for now, my work on the car is complete, and I am oh, so very proud of it… and so very grateful to all who helped to make it possible. This past week has been the most productive of the whole project to date. It feels like something just clicked, and the work is now progressing at an accelerated pace. Maybe it’s the four or five hours of work we’ve been able to put in every day (thanks to being on Christmas break), or maybe it’s the encouragement of seeing the light at the end of the tunnel. Maybe it’s just the daily double macchiato. Whatever, things are getting done and major progress is being made. We’re in the home stretch! The carpet is in. 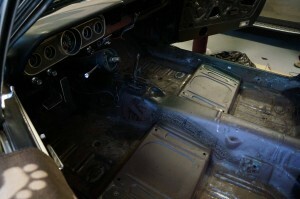 There was some major rust in the floor pans, so many hours were spent with a rust grinder and shop-vac. Everything eventually came out pretty clean. All was sprayed with Rust-Oleum, as an extra line of defense, but there was still the damage in the right-rear pan to contend with. There was already a patch on the underside of the hole, installed by Ricardo, so my dad had the idea of putting a metal sheet above as well, so that not as much stress would be placed on it when somebody stepped into the rear. Our first plan was to glue a sheet of steel down with liquid nails, but of course that didn’t work out. In hindsight, it wasn’t the smartest plan – gluing a steel plate to a not-very-flat surface – but it seemed a possibility in the moment. When that didn’t work, we replaced the steel with a sheet of aluminum, and the glue with screws (the way it should have been done in the first place). Unfortunately, and I’m still kicking myself for this, I didn’t get a photo of the final product… but try to imagine a shiny sheet of aluminum with 10-12 screws holding it down around the edges, and in any spot it was popping up. 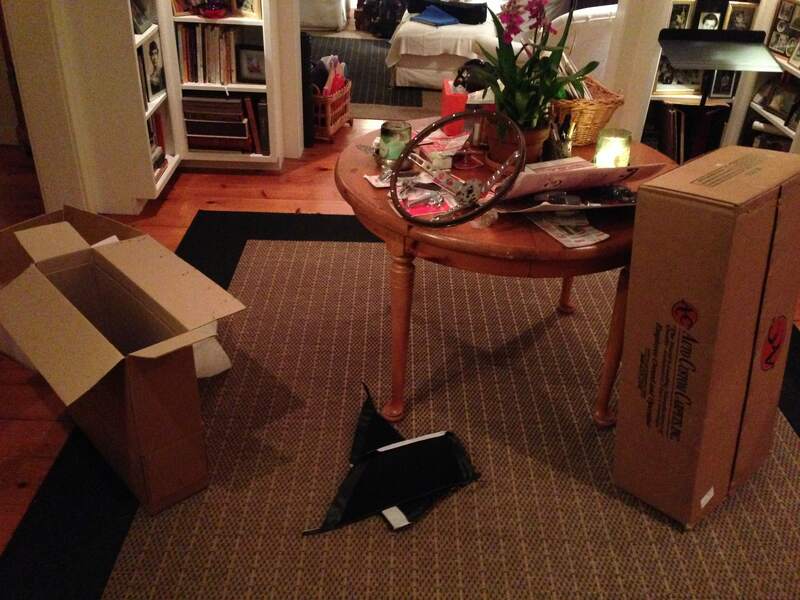 I guess I was too anxious to get on with putting the carpet down – I just forgot to photograph it. We cut the carpet – black instead of green, or rather yellow-green, as the original had become, and molded mass-back, meaning it has a nicely structured rubber backing – by laying it out across the template of the previous one to get a general fit. It still needs to be cut along the sides, in order to fit smoothly and not bulge out at some points, but it’s already a welcome change from what was there before. Next to go in were the new, fancy seat belts – and the hardest part of that was figuring out in what order the washers and nuts go on the big screw to effectively secure the belts. They are really nice looking belts, and will make the interior that much more special – and safe. The horn assembly has been taken off the old wheel and put on the new one. Everything cleaned up really well, and looks almost new. 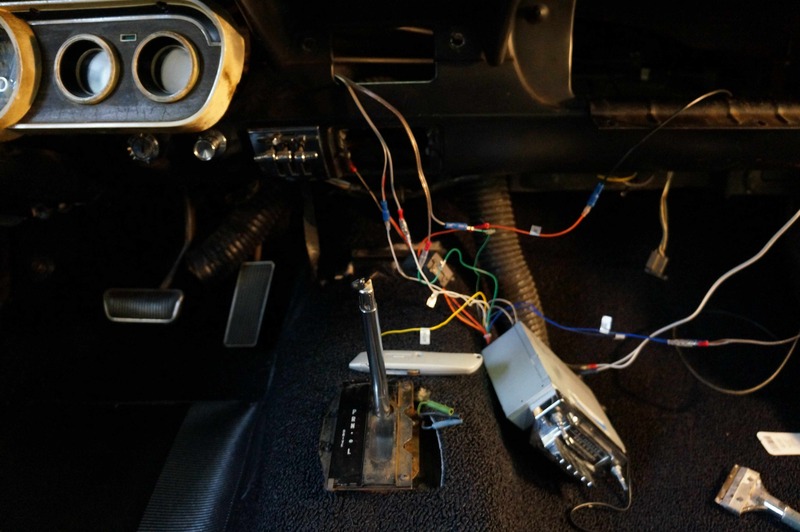 I still have to clean the inside of the assembly – the contacts, wires, etc. 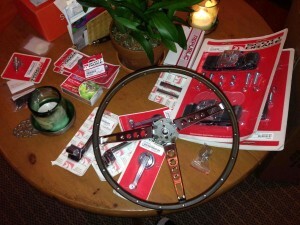 – and will install the new wheel as one of the last items, after the seats go in. 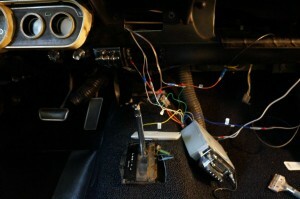 A major milestone was the completion of the radio wiring today. 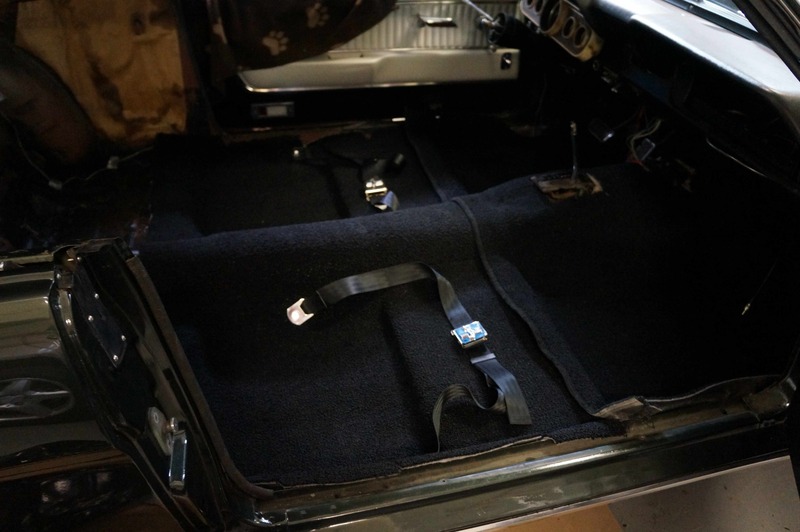 Before the carpet was in, I had laid down speaker wire from the new rear 6×9 speakers. I mounted the speakers in the new rear deck (this took a little longer than I had expected, as I ran into some difficulties with fitting the screws correctly), then ran wire to the left door speaker, and mounted both of those in place. Back in the summer, I thought we had found a constant source of power for the radio – but it turned out to be dome light wiring. As a result, it turned off whenever both doors were shut. The solution to this problem turned out to be running a wire directly off a lead from the positive terminal of the battery, through a small hole drilled in the fire wall, and into the radio. Everything turned out great, and now the radio is plugged in, mounted, and sounds amazing. We pretty much ran down the battery today listening to it while we worked. Other things accomplished this week were the new glovebox liner and door and the trunk carpeting. These went relatively smoothly, though the glove box liner needs a few more screws to secure it in place. The last major pieces to go in, apart from the center console and wheel, are the seats. 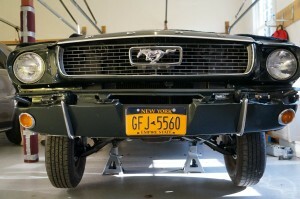 I ran into some trouble with CJ Pony Parts, the retailer I’ve been ordering all my parts from, due to a delay in the new upholstery. 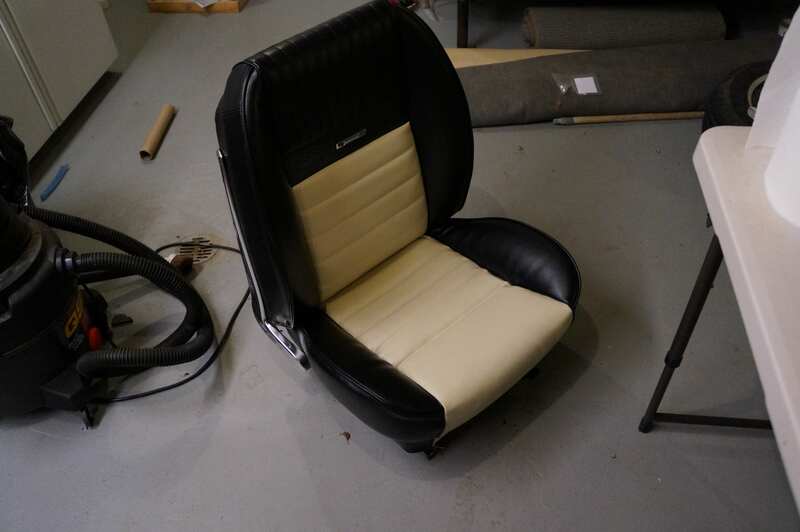 I had ordered the upholstery, seat foam, and a new driver’s side frame in early December – but while the frame and foam arrived in a timely fashion, the upholstery did not. When I reached out to customer service this week, I learned that the product was on backorder with the manufacturer and would not arrive until sometime around January 13th. Senior projects are due to be completed by January 8th. That was a pretty stressful period… until today, when I got an email saying that it had in fact shipped, and was due to arrive Friday (tomorrow). Of course, we are in the middle of a blizzard here, so who knows if it will get here tomorrow or the next day, but it certainly is better than the 13th. Big relief. I have posted a new photo album of the interior work Here and will be updating it until everything is done. The paint job is finally done, and boy, is it pretty! Ricardo did an amazing job. It’s incredible how much a fresh coat of paint has done for the look of the car. No longer are there scratches, chips and dents in the paint and body. Gone is the giant gash in the rear end. In its place is the deepest metallic Ivy Green and three layers of clear coat that make the car so shiny you can see your reflection in it. Yes, we are still waiting on the bumpers to arrive, but when they get here, sometime next week, the exterior will be done. Meanwhile, all operations have been relocated to the left bay of my Grandmother’s garage and the small workshop in her basement. 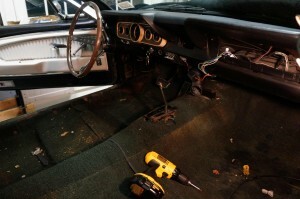 Day One of the marathon to finish the interior has concluded and the car is almost completely gutted. Out went the seats, door sills, seat belts and center console. Things went smoothly today, apart from some difficulties with removing the passenger seat. 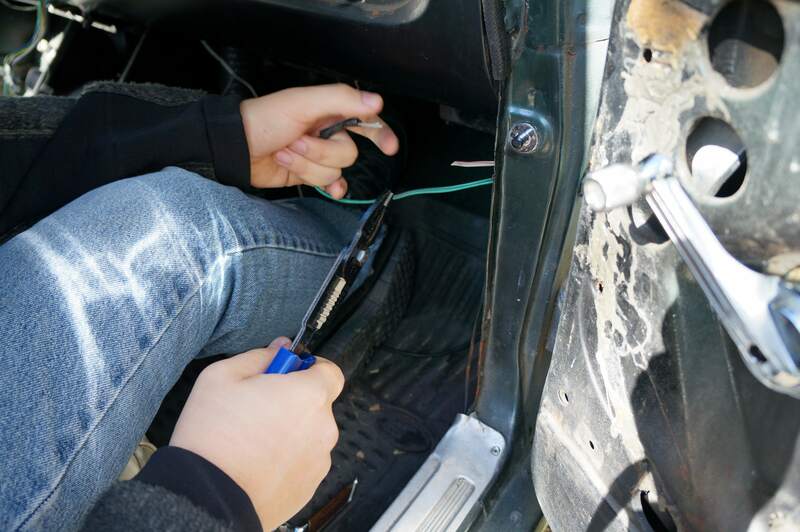 Ricardo had made a patch over some rust on the floorpan, and it had covered up one of the four access holes for where the seat bolts to the car. My dad – first assistant on this job – helped me drill a hole through the sheet metal patch, and eventually were able to get the seat out. 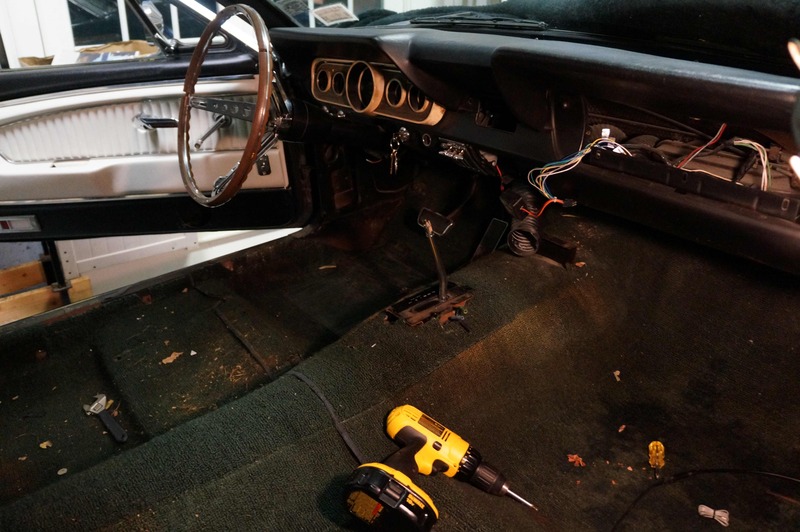 What’s in store for tomorrow is removing the steering wheel, laying the wiring for the rear speakers, tearing the old carpet out and trimming the new one to fit. Hopefully the day will end with the new carpet in place… The rest will follow. I visited Ricardo today to check in on the progress of the paint job, and it’s nearing its completion. I added a few more photos to the album. You can find them at the end of the existing album Here. 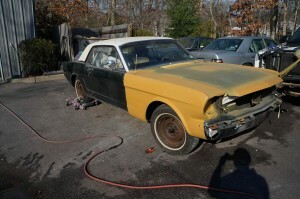 The green is about to be put on and the car should be done by the weekend. 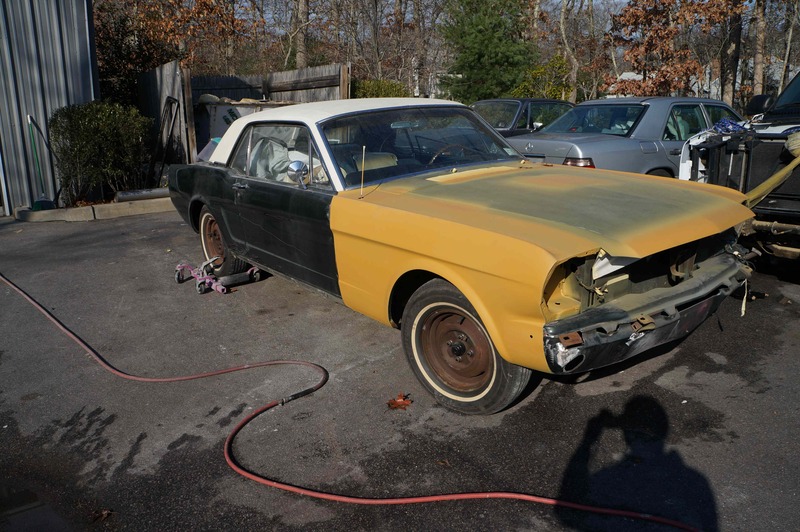 At long last, the Pony is finally getting its paint job! The decades of scratches, dings, dents and wear are being smoothed out and made to look like new again. After much deliberation and consultation, I chose to go with the same original Ivy Green color. 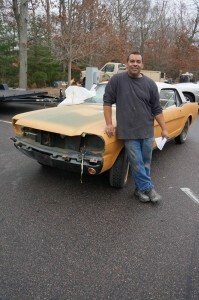 The man painting it, Ricardo Mendez, in Springs, NY, found several other things that should be, and probably will be, replaced or repaired while he has his hands on it – including the rusty bumpers. As of now, the body has been sanded, panels have been smoothed out, several coats of primer (first yellow, then grey) have been sprayed, and this weekend, if all goes well, he’ll be able to start applying the deep green. 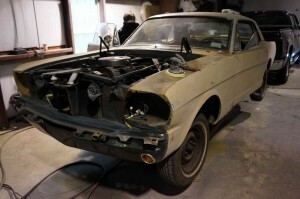 I’ve made a photo album of the paint job in progress that I will update as we go along. Click Here to see it. Timing is getting tight. The project is due to be completed by the beginning of January, when we come back to school after holiday break. That’s only a month left! 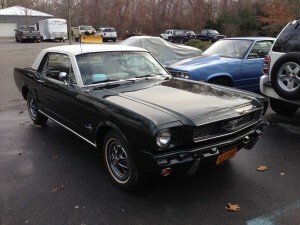 Hopefully, if the Pony comes back next week, I can spend the better part of the break working on the final interior pieces. The good news is, I took advantage of Black Friday sales. I managed to order nearly all of the parts I’ll need for the interior refurbishment – things like the carpet, steering wheel, seat belts, quarter panels, door/window handles, door panel clips, upholstery hog rings, and a rear shelf with speaker holes. The pile of boxes in my room is growing daily. I held off on buying any seat-related parts, because I need to inspect them more closely to see what actually needs to be replaced. I’m excited for the Pony to come home, and to start the last phase of this journey.